Is any of you Yu-chan fans a fan of Rurouni Kenshin? I gotta admit that I’ve never read the manga — but I hardly read any manga or comic, so… — and I seldom watched the anime series they just to show regularly on Cartoon Network. But I did watch (and own) that OVA movie… Samuari X: Truth and Betrayal. I kinda loved it. But I don’t know much about the Rurouni Kenshin universe, so I can’t tell you much. Megumi is the youngest daughter of Takani Ryūsei, a well-known doctor in Aizu which was an important province supporting the Tokugawa Shogunate. During the Boshin Wars, Megumi’s father died and the rest of her family went missing, leaving her as the sole survivor. 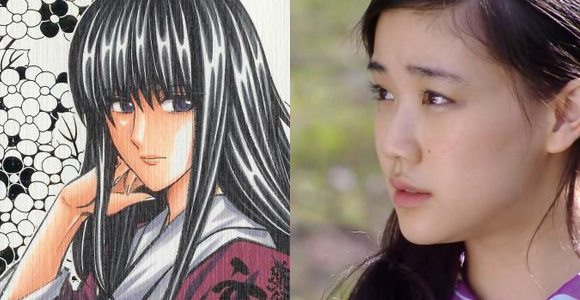 Watsuki’s describes his standalone Megumi as bearing a “lighter quality” as she had a small role in that story. In the final series Watsuki decided to give her an “earthy quality” so she could make an impression on the reader. Yu-chan is joined by Munetaka Aoki, who was on Nihonjin Shiranai no Nihongo and also shared credits with Yu-chan on NHK’s Taiga drama last year. Both actors will be back together with their Ryomaden director, Keishi Otomo.